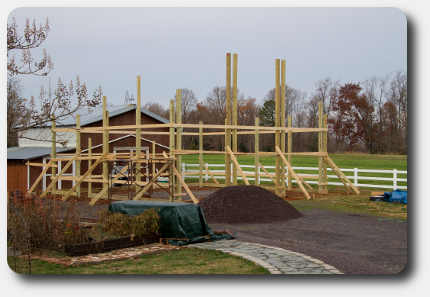 Use batter boards and mason lines to form the outline of the building dimensions. Mason lines should be about 12″ above grade. Posts are set 1 1/2″ inside the actual building dimension to leave room for the girts that are nailed to the outside perimeter of the posts (unless your construction technique will incorporate bookshelf girts). 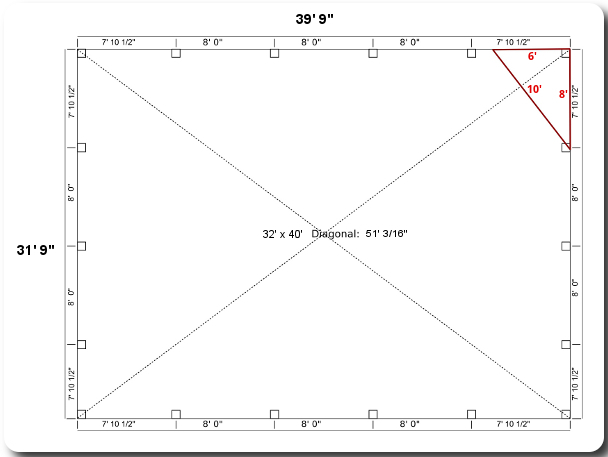 So when setting the mason lines for a 30×40 dimension the post will actually be set 1 1/2″ inside that dimension. After the basic outline is formed you need to get everything square. You can square corners using the 6-8-10 method shown below. To make sure the entire building is square the diagonal measurement of the building footprint should be the same when measured from corner to corner as illustrated below. Note that post spacing is measured from center to center of post except on the ends. Corner measurements are from corner of post to center of post. The post spacing on the corner is 7′ 10 1/2″ to make room for the girts as mentioned above. Set and plumb corner posts first. Then set each intermediate post keeping the post plumb and aligned with mason lines. You can’t go wrong with a 6×6 post but the orientation of 4×6 and laminated posts are shown below. The narrow side of the 4×6 is the girt nailing surface. The laminated post orientation is obvious in the drawing. All posts rest on a concrete footing. For smaller buildings a pre-cast footer can be used. Larger structures will require multiple bags of sakcrete or pre-mixed concrete to the specified depth. Posts should have uplift cleats or rebar for uplift protection. If the backfill is dirt use treated uplift cleats. For high wind areas requiring a concrete collar use rebar. 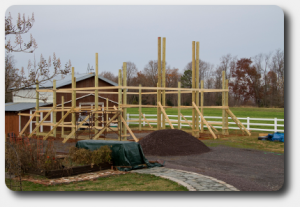 Use 2×4’s to brace your posts in place. Backfill with dirt tamping and compacting as you go. Recheck alignment adjusting as necessary to keep plumb. Posts can settle and shift if not properly compacted during backfill procedure. We have a footer size calculator on this page. The information required to get the size is listed on this page. If you have trouble or questions just call the office and we can help you fill the form out.